This beautifully designed oriental garden is in Mingus park in Coos Bay, Oregon. I was able to paint there in the spring when the trees were blossoming and set off the landscaping perfectly. 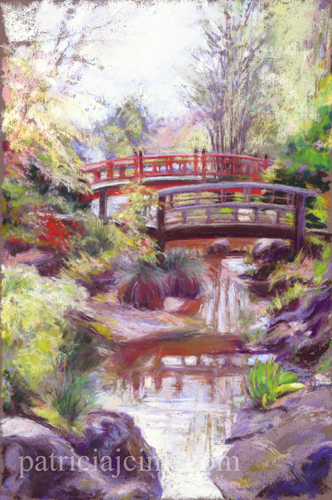 The Japanese garden was created to honor Coos Bay’s sister city of Choshi, Japan. These foot bridges connect the paths which go around Mingus Lake. The area has a very calming effect.